Approximately 300years ago during the Edo era, a Buddhist priest by the name of "Tankai" restored and reconstructed the temple, now being called "Shoten". It attracted many tourists and visitors from the surrounding cities and outer suburbs. Devine favors of the temple are nobility, business prosperity, domestic harmony, suitable candidates for marriage, parenthood and fulfilling love. 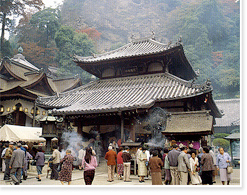 The main hall of the temple, together with a statue of "Miroku Bosatsu"sitting at the back on a rock face, is a magnificent view and is surrounded by buildings constructed from various ages. One of them "Shishikaku" is a western style guest house and is a complete sample of Meiji era western style building, which is rarely found in Nara prefecture. It is designated as an Important Cultural Asset. On the first and 16th of every month, many worshippers come, especially in September, for the Buddhist lantern festival which is one of the Eight Picturesque Sights of Ikoma. We can enjoy the old fashioned landscape consisting of long stone stairways leading to the Hozanji, together with teahouses and inns along the way. From Ikoma station of Kintetsu Nara Line, take cable car to Hozanji station.